CHIQUIMULA, Guatemala (Reuters) - More Honduran migrants tried to join a caravan of several thousand trekking through Guatemala on Wednesday, defying calls by authorities not to make the journey after U.S. President Donald Trump threatened to cut off regional aid in reprisal. 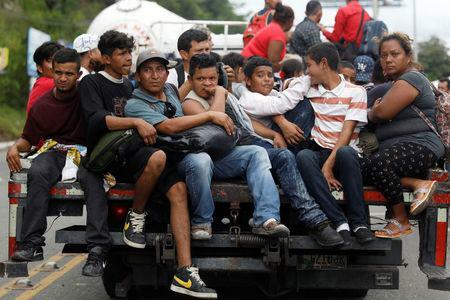 The caravan has been growing steadily since it left the violent Honduran city of San Pedro Sula on Saturday. The migrants hope to reach Mexico and then cross its northern border with the United States, to seek refuge from endemic violence and poverty in Central America. Several thousand people are now journeying in the caravan, according to a Reuters witness traveling with the group in Guatemala, where men, women and children on foot or riding in trucks filled a road on their long journey to Mexico. A first group made it to Guatemala City by dusk on Wednesday. They crammed into a migrant shelter and a primary school across the road and bedded down on inflatable mattresses. "My husband was an electrician. They killed him nine months ago," said Carolina Aguilar, 40, from the gang-controlled town of Choloma, sitting on a patch of ground with her two daughters, 17 and 11. "We don't have a house and I have no job. We only manage to live from gifts," she said. Many had hitched rides or walked about 150 miles (241 km)from the Honduran border. "We've lived in neighborhoods where our children have seen disaster after disaster," said Daisy Turcios, at an earlier stop on the road. "We have seen dead bodies thrown in front of us. So that's my goal, in truth, to reach a country where life can change for my children." Nearby, kneeling in the dirt, Abigail Castro kissed her small son and wrapped her most precious documents into a plastic bag, waterproofing them against uncertain conditions ahead. "Whatever money I have, I need it to buy drinks for my son, fruit," she said. Some friendly Guatemalans had offered transport in pickup trucks or cars, she said, but "everyone wants to get on" so they would have to go by foot. Guatemalan President Jimmy Morales said on Wednesday his government rejected constraints placed on foreign aid. "No help can be conditioned and no help can be demanded," Morales told reporters in the Guatemalan capital. He said he had spoken with his Honduran counterpart, President Juan Orlando Hernandez, about ensuring that those migrants who want to return home can do so safely, and cited reports indicating that many people from the caravan are returning to Honduras. President Trump decried "horrendous weak and outdated immigration laws," in a series of Twitter messages starting on Tuesday. He threatened to cut off aid to Honduras, Guatemala and El Salvador if they fail to prevent undocumented immigrants from heading to the United States. "Hard to believe that with thousands of people from South of the Border, walking unimpeded toward our country in the form of large Caravans, that the Democrats won't approve legislation that will allow laws for the protection of our country," Trump said on Twitter on Wednesday. The Honduran government has urged citizens not to join the caravan, calling it politically motivated. On Wednesday morning near the Guatemalan border, authorities could be seen stopping Hondurans still hoping to join, with police in riot gear at one checkpoint halting buses carrying at least a hundred people. The men, women and children carried on toward the border on foot, Reuters photographs showed, with some later fording a jungle river near the frontier after unconfirmed reports that Guatemalan authorities had stopped letting Hondurans enter the country. Guatemalan authorities did not provide an estimate of the size of the caravan, which aims to pass through Guatemala City before heading to Mexico. Adult citizens of Honduras, Guatemala, El Salvador and Nicaragua need only present national identity cards to cross each others' borders. That regional immigration agreement does not apply when they reach Mexico. Mexico said anyone who enters the country with a Mexican visa can move freely, while those without proper documents would be subject to review and could be deported. "This measure responds not only to compliance with national legislation, but particularly to the interest of the Mexican Government to avoid that such people become victims of human trafficking networks," the foreign ministry said in a statement.